I had a birthday last week and got an interesting present. My mother-in-law gave me a bunch of great stuff but then I got to this one wrapped present that when I opened it I had no idea what it was. 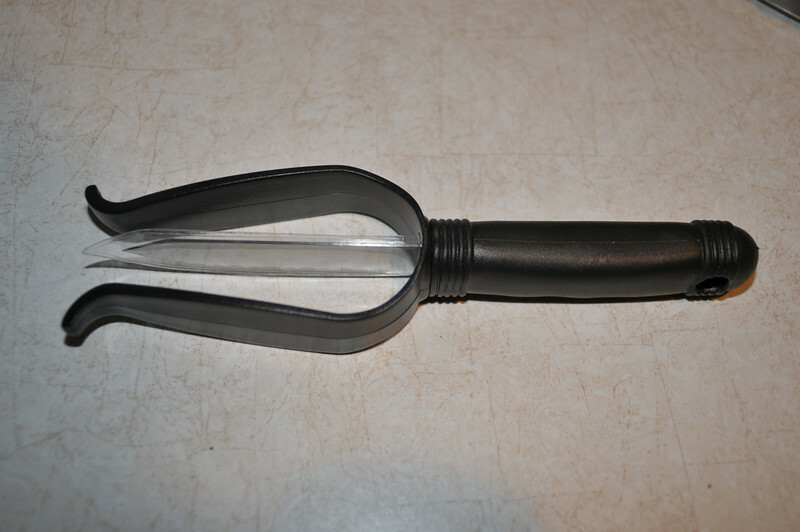 My wife suggested it might be a bagel cutter but we weren't sure exactly how it would work. Now luckily - there was a card in the box from the company it came from which said to call if you had any questions. After finally getting an operator -a story for another post - we asked what it was. It seems it was one of those gifts you get for opening a credit card or that you redeem out of a catalog, like one of those 'As seen on TV' gadgets. They had no idea what it might be either and after talking with the nice woman on the other end of the line I finally broke down and called my mother-in-law. It had come already wrapped when she received it and she thought there had been a sticker on it that also said bagel cutter. (and no Mom - I don't mean to make fun of the gift - it really has become a conversation starter - and yes I liked all the rest of the presents). So - I thought I would ask all of you your opinion. I had Sue buy bagels the next morning on the way home from coaching and set out with my new (used) manual focus macro lens to shoot it for you all to decide. Feel free to leave a comment. I enjoyed this blog entry. I must say for what I paid you got my money's worth in entertainment even if it never cuts a bagel. 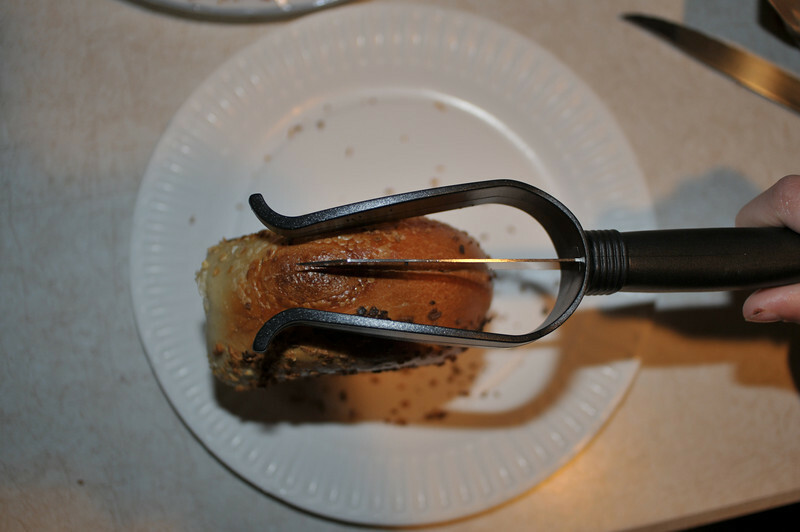 There was a 1/8" x 1" label on the outside that said "bagel cutter". 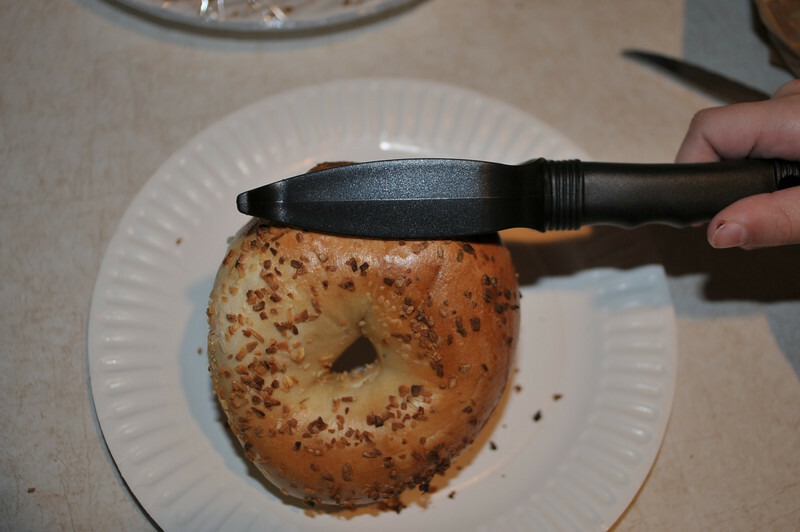 I assumed it cut bagels..... It was actually in a bunch of stuff they were selling as stocking stuffers at Building 19. I think they were $1 at Christmas time, but I got 75% off, so for 25 cents, I thought it a great gift for my son-in-law (afterall, how much do you want to spend on a son-in-law!). Since they were sealed, I couldn't check it out. (I guess we know why they were sealed!) I think there was a poster that showed a drawing of it, but not well enough to figure out how it worked or to realize it wouldn't be too useful. At any rate, I'm glad you got some entertainment value out of your gift. I'll have to keep watch for more 25 cent items for future gifts.